Drive through Dortmund with your rental car and get to know this beautiful city in the Rhine-Ruhr metropolitan region of North Rhine-Westphalia. With a retal car you travel independently and comfortably. Experience the economic and trade centre of Westphalia and discover the many different sights of the most populous city in the Ruhr area with your rental car. Dortmund is the most important traffic junction in the region. 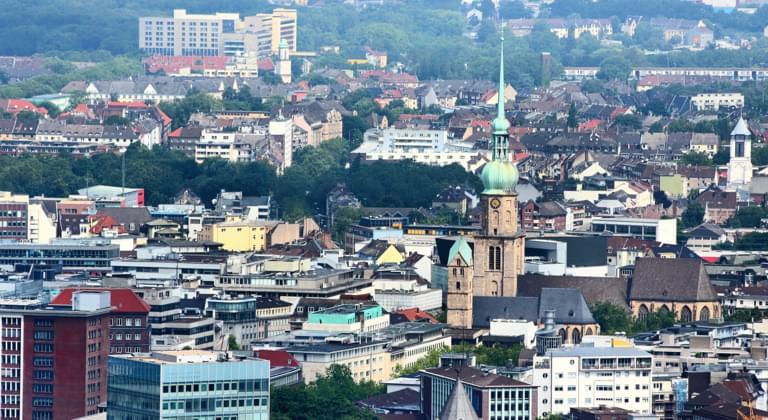 The city is perfectly suited for a city holiday, as there are numerous exciting and interesting excursion destinations both in Dortmund and the surrounding area. With a rental car you can reach any desired location cost-effectively and flexibly. Book a cheap limousine, SUV or compact car by using the Driveboo price comparison, which compares the best deals for you. Whether it's a visit to Signal Iduna Park, Borussia Dortmund's home ground, or the shopping street: your rental car will take you to the most beautiful places in the city. Get to know North Rhine-Westphalia and Hesse better and explore the beautiful half-timbered houses, rural and green areas and exciting cities. Take a break in Siegen, Dusseldorf, Wetzlar and Giessen. Or how about a tour to Cologne? Stroll along the Rhine, visit the opera and enjoy the regional Westphalian cuisine. You can also book the rental car for a holiday trip with the whole family. In Dortmund you can visit the cinema with the children in the afternoon, go for a walk in the park or relax in the outdoor pool. With the Driveboo price comparison you can book the perfect vehicle for the right price for any occasion. 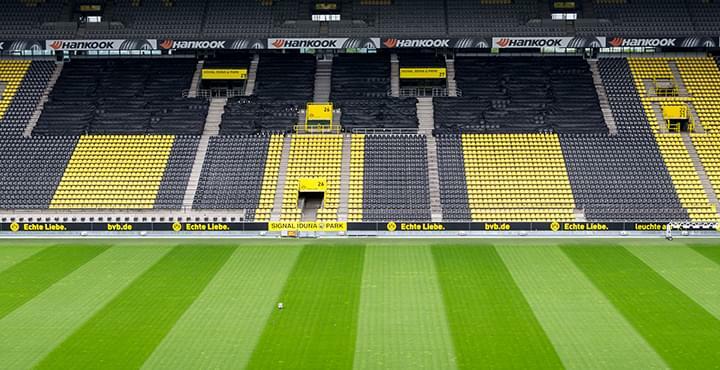 The training of the Borussia Dortmund football team takes place in the former Westfalia stadium, now known as Signal Iduna Park. You can watch the team training in public or buy a ticket for a home match. Other popular excursion destinations are the German Football Museum, the Dortmunder U, the Reinoldi Church and Lake Phoenix. Another highlight is the St. Petri Church. The hall church in high Gothic style, which was built according to the classical, ideal-typical building scheme, consits of side aisles and a middle aisle that are equally high. The ground plan of the church is almost square, the choir is relatively short. The construction of the church originally started in 1322. In 1752 the tower helmet collapsed, only in 1981 the historical height was restored. Today the tower helmet has a height of about 60 meters. The substructure is about 15 meters high, the spire including cross and globe measures 48 meters. The overall height of the St. Petri Church is impressive: it reaches a height of 105 metres. Inside the church you can admire the so-called "Golden Miracle of Westphalia". It is a magnificent carved altar that has been lavishly restored. The late Gothic winged altar dates from 1521 and shows the worship of the Eucharist. If the altar is unfolded, 36 detailed pictures appear in the first stage. The Museum of Art and Cultural History is housed in the original Städtische Sparkasse. The building was erected in 1924. The exhibits include furniture, paintings, sculptures and handicrafts. You will get an insight into the cultural history of the city. The Adlerturm Museum is dedicated to the medieval history of the city. The special thing about the city's museum landscape is that it offers a broad spectrum. With a rental car you can travel cheaply and easily to the most beautiful museums in North Rhine-Westphalia. Decide spontaneously for an excursion such as a visit to the theatre, the opera and many other exciting places. Would you like to drive up to the opera in the evening? Choose the model you want from the wide range of rental cars on offer. You decide whether you prefer a sporty model, a limousine or a luxury vehicle. You will receive a suitable rental car for one or more days at a favourable price. The booking is uncomplicated and can be made online at any time. A convertible is a very good choice for summerdays in Dortmund. Discover the surrounding area of North Rhine-Westphalia and go on exciting excursions. From a geographical point of view, the city is located at the border between the northern lowlands and the southern hills. Get in your rental car and drive into nature to discover the region around Dortmund. Indulge yourself in the convertible in the warm sunshine and choose a romantic place for a picnic for two. If you opt for a compact cabriolet, the search for a parking space in the city will be simple and uncomplicated. Many models have a powerful engine, which guarantees great driving pleasure. If the roof can be closed electrically, you don't have to be afraid of a short rain shower. By the offers with Driveboo you rent favorably a sporty vehicle, which makes your vacation unforgettable. If you want to go on holiday with your family, you need a large vehicle that is safe, spacious and also cheap to rent. The Driveboo price comparison allows you to select the right car within a few minutes. A large-capacity limousine or a 7-seater or 9-seater offers space for up to 9 people. Depending on the category selected, luggage can also be stored. Bicycles can often be transported on the roof, so make sure you have a roof rack when booking. The rental car is also worthwhile if you want to travel on holiday with a caravan, but your car cannot pull the load or there is no trailer coupling. Through car rental you will find powerful models that are excellently suited for this purpose. From Dortmund in North Rhine-Westphalia, for example, you can start with your rental car in a northerly direction. Thanks to the good transport connections to the motorway network, you can reach the North Sea within a few hours. When booking, you can opt for an offer with a sufficient number of inclusive kilometres and make your holiday with your family more economical. Do you have a business appointment in Dortmund and would like to rent a car for it? In this case you benefit from the simple procedure. You book the car online and select the pick-up point and drop-off point. Make a lasting impression on your business partners with a luxury vehicle and treat yourself to the luxury of a horsepower-strong and comfortably equipped rental car. This can be booked by the price comparison favorably. Renting company cars offers you flexibility and cost savings. You save yourself permanent maintenance costs because you only rent the car when it is needed. Or would you like to travel from Dortmund to another city by plane? In this case you can use the rental car for the trip to the airport. The rental car can also be used in the city if you have traveled to Dortmund by plane and want to be mobile during your stay in the city. Compared to daily taxi rides, the rental car is cheap and practical. You have a car at your disposal at all times to discover North Rhine-Westphalia. On business trips, spontaneous meetings often occur which require a high degree of flexibility. In addition, you must take important documents with you and need to have them at hand all the time. Your laptop and briefcase must be transported safely. Use the rental car to get to all of your appointments in time and to be able to arrange the remaining leisure time according to your wishes. You can use the rental car in North Rhine-Westphalia for business as well as private purposes. This way you don`t need expensive taxi rides and you can decide spontaneously when the trip starts. If you would like to take a round trip through North Rhine-Westphalia, a rental car is also a good choice: it will take you to the next destination cheaply and easily. With Driveboo you are able to return your rental car at another station than you collected it. When you book the rental car, you can choose where you want to pick it up and where you would like return it. Start in Dortmund and drive south to Frankfurt. What to bear in mind when returning a rental car: when returning your rental car to the local car rental company, you simply adhere to the contractual rules laid down in the rental conditions. No matter whether you want to leave your rental car at the airport, at the station or at one of the stations in and around Dortmund. Make sure that you comply with the return location, return time, return date and return station - as stated in your individual offer. Simply start a price comparison yourself and convince yourself of our favourable offers. With your rental car you are flexible and independent of public transport. So you can discover Dortmund and its many highlights to your heart's content.